 S. C. Pei and J. J. Ding, “Relations between the fractional operations and the Wigner distribution, ambiguity function,” IEEE Trans. Signal Processing, vol. 49, no. 8, pp. 1638-1655, Aug. 2001. S. C. Pei and J. J. Ding, “Relations between Gabor transforms and fractional Fourier transforms and their applications for signal processing,” accepted by IEEE Trans. Signal Processing. J. J. Ding and S. C. Pei, “2-D affine generalized fractional Fourier transform,” ICASSP’99, vol. 6, pp. 3181-3184, 1999. S. C. Pei and J. J. Ding, “Integer discrete Fourier transform and its extension to integer trigonometric transforms,” ICASSP’00, vol. 5, pp. 513-516, 2000. S. C. Pei and J. J. Ding, “Eigenfunctions of the canonical transform and the self-imaging problems in optical system,” ICASSP’00, vol. 1, pp. 73-76, 2000. S. C. Pei, J. J. Ding, and J. H. Chang, “Color pattern recognition by quaternion correlation,” ICIP 2001, vol. 1, pp. 894-897, 2001. S. C. Pei and J. J. Ding, “Fractional, canonical, and simplified fractional cosine transforms,” ICASSP’01, vol. 6, pp. 3545-3548, 2001. S. C. Pei, J. H. Chang, and J. J. Ding, “Quaternion matrix singular value decomposition and its applications for color image processing,” International Conference on Image Processing 2003, vol. 1, pp. 805-808, Sep. 2003. S. C. Pei, J. H. Chang, and J. J. Ding, “2D Quaternion Fourier Spectral Analysis and Its Applications”, ISCAS 2004, May 2004, vol. 3, pp. 241-244. J. J. Ding and S. C. Pei, “Reducing sampling error by prolate spheroidal wave functions and fractional Fourier transform”, Proc. IEEE Int. Conf. Acoust., Speech, Signal Process., vol. 4, pp. 217-220, 2005. S. C. Pei, W. L. Hsue, and J. J. Ding, “Discrete fractional Fourier transform based on new nearly tridiagonal commuting matrices”, Proc. IEEE Int. Conf. Acoust., Speech, Signal Process., vol. 5, pp. 385-388, 2005. S. C. Pei and J. J. Ding, “Reversible Integer Color Transform with Bit-Constraint”, International Conference on Image Processing, vol. 3, pp. 964-967, 2005. S. C. Pei and J. J. Ding, “New Corner Detection Algorithm by Tangent and Vertical Axes and Case Table”, International Conference on Image Processing, vol. 1, pp. 365-368, 2005. J. J. Ding and S. C. Pei, “Fractional Fourier transforms and Wigner distribution functions for stationary and non-stationary random process”, vol. 3, pp. 21-24, ICASSP, May 2006. S. C. Pei and J. J. Ding, “Improved reversible integer transform”, pp. 1091-1094, ISCAS, May 2006. S. C. Pei and J. J. Ding, “Relations between Gabor transforms and fractional Fourier transforms and their applications for signal processing”, accepted by EUSIPCO 2006. Y. C. Zeng, S. C. Pei and J. J. Ding, “DCT-based image protection using dual-domain bi-watermarking algorithm”, CIP, pp. 2581-2584, Oct. 2006. 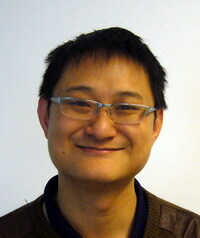 S. C. Pei and J. J. Ding, “Improved Harris’ algorithm for corner and edge detections,” accepted by ICIP 2007. S. C. Pei and J. J. Ding, “Discrete-to-discrete prolate spheroidal wave functions and finite duration discrete fractional Fourier transform,” accepted by EUSIPCO 2007. S. C. Pei and J. J. Ding, “Quaternions and biquaternions for symmetric Markov-chain system analysis,” accepted by EUSIPCO 2007. J. J. Ding, S. C. Pei, G. C. Guo, J. D. Huang, Y. C. Lin, Y. S. Zhang, and N. C. Shen, “Images sharing the same amplitude spectrum but different phase key,” CVGIP, 2007. J. J. Ding, S. C. Pei, J. D. Huang, G. C. Guo, Y. C. Lin, N. C. Shen, and Y. S. Zhang, “Short response Hilbert transform for edge detection,” CVGIP, 2007.